Triathlon-Duathlon-Running-Multisport. I’ll take the burden of planning and interpreting your training off your shoulders to help you achieve your goals and avoid making fundamental training mistakes. Custom Coaching rate starts from $250/month, the amount is customized based on the athletes requirements and expectations. An alternative method is the Subscription Method which costs US$29.95. This allows you to download any of our database plans but without the expense of a full-time coach. As a Triathlon New Zealand accredited, Training Peaks Certified and Ironman Certified coach I have been helping athletes since 2010. I am a Lydiard accredited run coach and I also come from a background of Sports Medicine, initially being a NZ Registered Sports Podiatrist, having worked in this field for over 10 years before deciding to lead my career down the coaching path. I have raced successfully as an Age Grouper at all distances of triathlon and have completed 16 IronDistance events, qualifying for 3 Ironman World Championships in Kona. 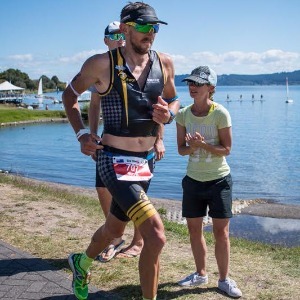 I have competed at the ITU Long Course and Standard Course World Championships, have placed several times in NZ Age Group Triathlon and Duathlon Championships and raced the Multisport World Championships. I understand the importance of a training programme that fits in with people’s daily commitments and I am very enthusiastic about coaching. I prefer my athletes to use a GPS, HR Monitor and a power meter so as I can follow and interpret progress and optimize the athletes training. Success. Coach Rob Dallimore has been notified of your message.